A lot of times I worry that I'm being overly critical when it comes to LGBT movies. A lot of them are well-meaning independent film projects that are driven by earnest enough individuals who feel that they have a good story to tell. But seriously, when you get down to it there are a lot of movies out there that either don't quite deliver their message well or perhaps should consider the audience for the story. Big Gay Love feels like quite the labor of love, especially since it did start as a Kickstarter project. And the fact that it reached its funding goal with about 300 backers, it goes to show that a good number of people became rather invested in this particular story. As a rather large gay man myself, you'd think that I'd appreciate a story that tackles this particular sort of story. And while I did find some common ground with some of the protagonist's insecurities, there wasn't much else to like about how this story came together. And why is Xander always playing a cook? 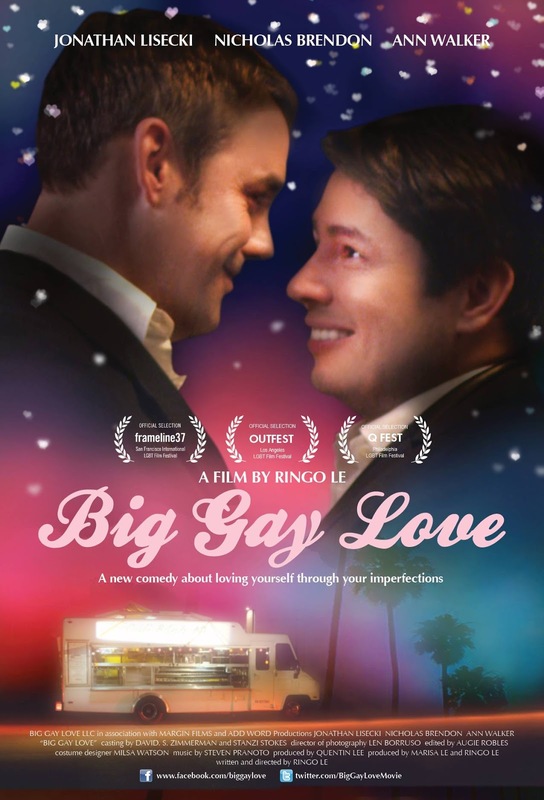 Synopsis: Big Gay Love is an independent LGBT comedy written and directed by Ringo Le. It was primarily funded by a Kickstarter project that reached its goal on March 23, 2013. Bob (Jonathan Lisecki) is a single gay party planner who appears to have a great professional career but no meaningful personal relationships. And most people in this world, he does hope to one day find the man of his dreams. But like most overweight people in this world, he also feels frustrated at how much the gay scene seems obsessed with physical beauty. It probably doesn't help that two of his closest friends, Aidan (Todd Stroik) and Chase (Ethan Le Phong) both fit perfectly into the stereotype of the "physically perfect" gay man. Things change when Bob happens to meet a chef named Andy (Nicholas Brendon) who appears to be genuinely interested in Bob. Despite this, Bob continually doubts Andy's affections and allows his personal insecurities dictate his decisions. Thus the movie explores how these two try to get past the usual stereotypes around what attractiveness is and how one can define love. And we also have Bob going as far as considering cosmetic surgery just to fit the typical image of beauty more in order to feel better about himself. The movie's official synopsis uses loftier language to present this movie as the effort of a gay man trying to overcome weight-based discrimination. But that wasn't readily apparent in this movie - if anything the only person who seems to hate Bob is Bob himself. It's already clear that he has a great job and is supposedly good at being a party planner (this is not clearly established on-screen) since he's considering buy a house for himself. It's one thing to feel insecure about one's weight - we've all been there before after all. But it's an entirely different thing to be a paranoid, self-destructive freak that feels like the more typical stereotype that a lot of LGBT movies focus on. Thus it's hard to find redeeming qualities in Bob since the only real conflict in the movie is because of his own fears and self-loathing. Andy just appears to be a guy genuinely hoping to know Bob better and have a chance to establish something serious with him but Bob repeatedly pushes him away without good reason. A lot of elements in this movie are merely presented as fact without helping the audience truly understand how they came to be. From the get-go Andy simply likes Bob and we just sort of leave things at that. We just accept that Chase and Aidan are Bob's friends when in all their scenes together it's hard to figure out what common ground they have or what ties them together. Bob's mother, meant as a sassy character cameo by Ann Walker that contributes little to the overall narrative. To sum things up, Bob is not a likable character, and it's hard to understand why everyone puts up with him for as long as they do and why Andy is initially determined to get into a relationship with him. And perhaps this was supposed to be the message - the sort of self-destructive behaviors that overweight people get into and how they push away those who are close to them. It's not too bad a potential message, but if this was supposed to be it, then it wasn't delivered in a manner that makes the movie palatable. At no point do you feel the desire to cheer for Bob or support him given the supposed harshness of the world. And that's because Bob is only a victim of his own self-loathing. Big Gay Love could have been a much better movie if it had figured out its narrative focus or determined a better way of presenting Bob's struggle in the world. Instead is because a weird whiny movie that has Bob beating up on Bob and then things magically getting somewhat better towards the end. And so I can only really rate the movie as 1.5 moments of Nicholas Brendon sincerely trying to make something out of this movie out of 5.